If you need an excuse to host a little dinner party, then Halloween is just around the corner. Or maybe it’s something you’ve had planned for months? Either way, we’ve got some tips for you to make it wonderfully wicked; or maybe that should be wickedly wonderful! Whatever you go for, make sure you’re spooking with style at your hauntingly good Halloween dinner party (we promise to not use another pun in this article). We love the idea of the Graveyard Mousse Pots from Wallflower Kitchen. Now they use Nakd pots of mousse in this one, so you’ll have to find your own. Or try this one from Donna Hay. We’re going for spooky sophistication so serve up a styled charcuterie board amongst your spooky Halloween décor, or try something different with this Mummy wrapped brie. Leave the lollies at the door and keep your guests sufficiently satisfied. Black poison toffee apples, to go with your black dinner table. Who didn’t love a toffee apple as a kid, I mean it’s good for you right? It’s made with an apple?? These will certainly create a sleek and spooky addition to your menu plan. Monster or mummify? Make a huge impact on arrival by turning your front door into the feature. We’ve found some easy tutorials for both on Modern Day Moms or East Coast Creative Blog. Let your guests know what they’re in for from the moment they arrive. Lead them with lighting, such as this example we found on Pinterest. Use candles instead of lamps and big overhead lights. This will help to create an atmosphere that’s both spooky and sophisticated. Use your food to allude to the Halloween classics, bats, spiders, ghosts, etc. This will bring a touch of fun, without turning into a Halloween cliché. Something like this marshmallow spider web cake. Pumpkins are a symbol of Halloween, but they don’t have to look like the movies, or like you’ve got your inspiration from the local party shop. 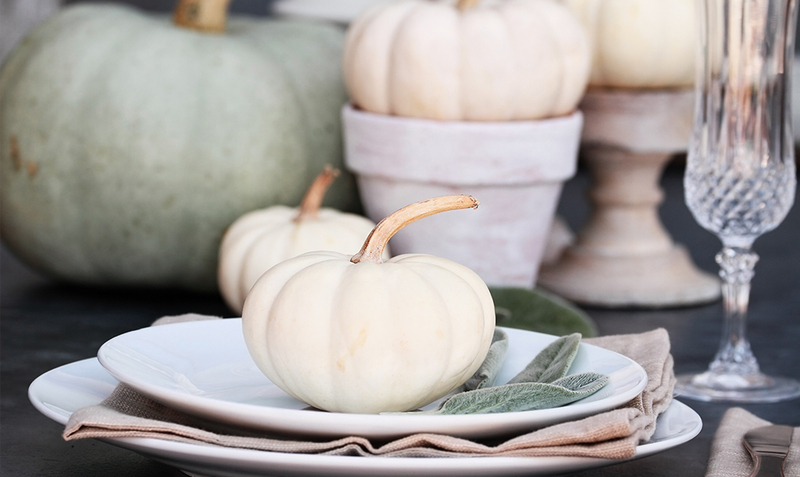 We’ve found some excellent ideas here of how to decorate your pumpkins in a totally chic way. Ditch the Martini glasses and go for something more dramatic. We found an excellent idea which uses vials instead of glasses Then gather some inexpensive candle holders, paint them black, and use them to hold your vials of cocktails. We recently found an idea on Pinterest from Camille Styles, of a black on black dinner table setting a loved it! The colour sets the tone perfectly for Halloween but also creates something chic. She details out how to create each part of the table, from the candles to the wax-dipped red roses. We hope we’ve sufficiently inspired you to create your spooky, but hauntingly good, Halloween dinner party.